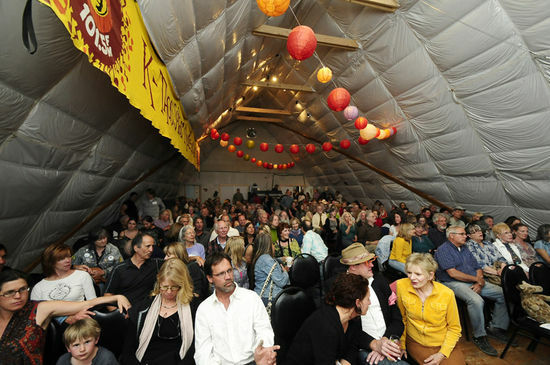 Thrive Taos was started by Wendy Robbins, Oct. 2011 to share ideas on sustainability and to create community. We meet every Thursday for 2 hours and have different teacher show us hands on techniques on: gardening, bee keeping, rain water harvesting, taking care of animals, sprouting, composting, share heirloom seeds, awesome inventions, emergency preparedness, medical training (CPR, Natural remedies) etc. We got everyone to have enough food and clean water for emergencies and talked through checklists of what we all may need in case of disaster. We focus on solutions and don't go into fear-based conversations. We just remind each other to take action now and help teach what is needed to deal with "disasters." We work with hourworld to create our own version of an alternative currency based on service exchange. We created an organic food co-op, work with local farmers to have them be able to sell year round not just at the farmers market. We also invested in farm shares so that farmers didn't have to get loans and insured that their food would be GMO free and they use heirloom seeds. We worked with the Taos Pueblo to help create a community garden and have gotten land donated to our group to be able to farm. We're working with Occupy Taos to create community resolutions about corporations not being human beings, stopping the NDAA, a community manifesto, etc. We are reaching out to the community as a whole to become a hub of all the stuff Taos is doing - for families, kids, environment, arts, feeding the hungry, animals, politics, etc. We've fed hungry people, gotten people wood in winter, and helped businesses begin or grow. We'll have upcoming workshops on archery, firearm safety, earthship building, earthbag building, straw bale building, etc. We are producing a short film on all the awesome stuff Taos and Thrive Taos is up to demonstrating what others can do to create community, teach each other what is and isn't working and share a bit from the 12 sectors or committees. We are starting to shoot mid to late June with the idea of being done by end of July/early Aug. We got the local university (UNM) to donate a camera, lights, mics, editing, shooters, animation and a green screen space. We raised money for hard costs by showing Thrive and hosting Foster and Kimberly Gamble, the filmmakers of THRIVE, and had almost 300 people show up paying $10 each. We had a bake sale, and a private auction to raise a bit more. At the screening I asked Foster and Kimberly to distribute our film through the Thrive community and that is creating the excitement for everyone to help out here. We have had several communities ask us to help them start a community group like the one we have and will address this in our short film. The 12 sectors so far have not worked out great since we have such an influx of members. We have over 600 on Facebook, a healthy email list and have 50 to 70 show up weekly. We have some people who really like creating sub-groups but found that what we were doing before works really well. Short 10 to 15 minute talks with interaction and hands on demos with 5+ speakers and we shift focus from health topics, to spiritual to environmental, to emergency preparedness, to meditation and communication skills. OUR GROUP is THRIVE TAOS. We can be found on facebook (http://www.facebook.com/groups/179709172111484/) and welcome everyone to be part of our group as we have members all over the world though most are in Taos.